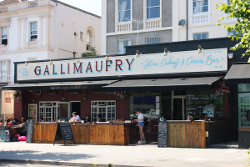 First a quick note just to let all members who were planning on coming to our next members’ meeting that we will be having a mainly social affair at our newest pickup point, the Gallimaufrey on Gloucester Road , directions here, (this is instead of our usual venue the Horfield Meeting House as was announced in the last email blast.) The meeting will still be on 30th April at 7:30 pm. We hope to see you all there! You are free to show up on any or all of the dates above, but we just ask that you let the gang boss Tim Lawrence know in advance at urbanvegtim@yahoo.co.uk if you are coming so he can plan ahead.